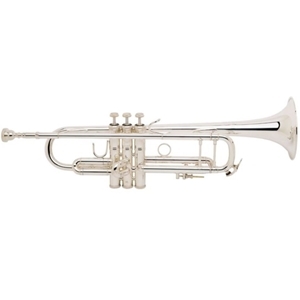 The LT180 series was designed for players seeking a lively trumpet with a brighter sound and quicker response. The lightweight body and one-piece hand-hammered professional bell in #43 taper and the standard construction #25-O mouthpipe add to the controlled centered sound and brilliant tone of this "Stradivarius" model. The silver-plate finish provides a controlled brilliance to the overall sound. The LT180S43 with a .459" medium-large bore will rise above the sound of any ensemble.